The Friday panel and reception will take place in Houston Hall. The keynote address on Saturday will take place in Claire M. Fagin Hall; all other Saturday and Sunday sessions will also be held in Claire M. Fagin Hall, and the poster presentations in the first floor lobby area. Please note that the venue has changed from previous years, and that we are in different buildings on Friday and on Saturday/Sunday. On Friday, please enter through the east entrance of Houston Hall on the Perelman Quad. Proceed down the stairs to the registration desk just outside the ground floor entrance to the Hall of Flags. Please follow the signs with the PLC42 logo. 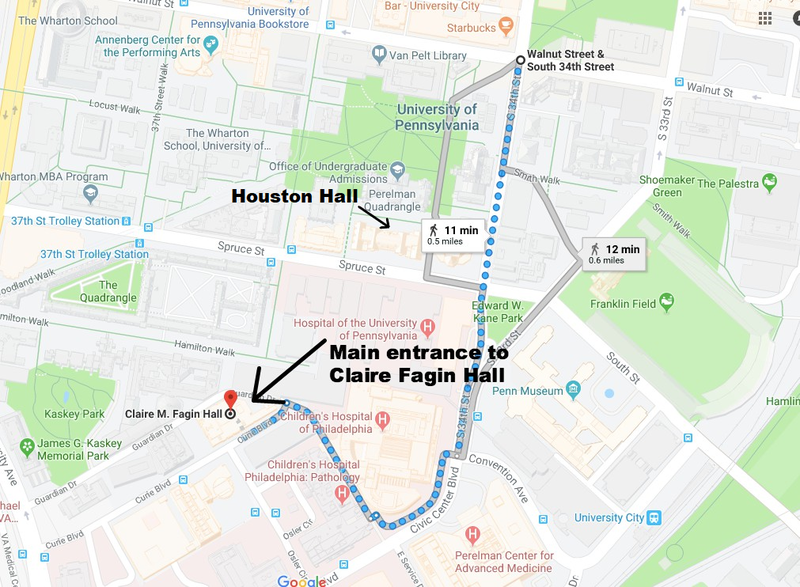 On Saturday/Sunday, please look at the map here to Claire M. Fagin Hall. 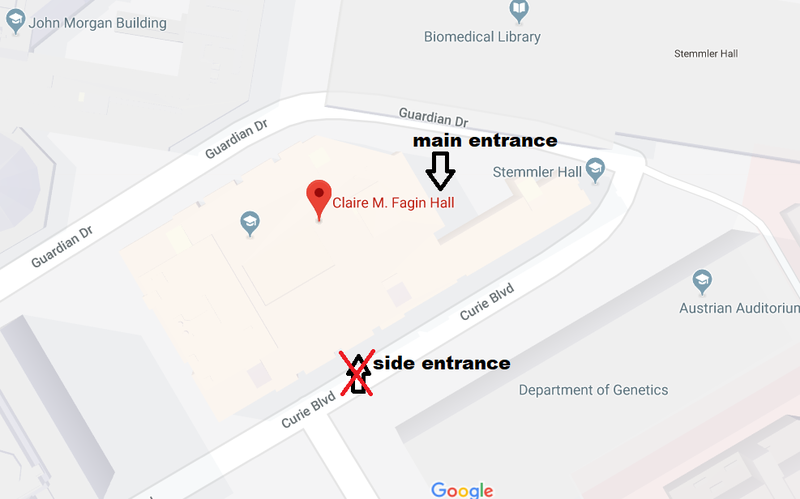 Please note that you should use the MAIN ENTRANCE to Claire M. Fagin Hall. Google Maps directs you to the SIDE ENTRANCE [see the different entrances here]. When inside Claire M. Fagin Hall, follow the directions under the PLC42 signs to find rooms 116 and 118. On the Saturday of PLC, there is an additional admissions event going on inside Claire Fagin Hall so be aware that people may be heading for non-PLC related rooms. Therefore please follow the PLC signs carefully! Due to university policy, a state-issued ID or passport is required in order to consume alcohol at the reception Friday evening. Public Transportation: One-way ride on bus, subway or trolley costs either 1 token ($1.80, available at subway stations, Penn bookstore and other local vendors) or $2.25 in cash. (Bills and/or coins are accepted, but buses and trolleys will not give change. For example you can pay $3.00 but won't be given $0.75.) If you want to transfer to a second bus/subway, it costs an additional $1, and you need to ask the driver/booth operator for a transfer ticket when you first board. Here is a complete list of token sales locations. More information is available on the SEPTA website. Shuttle: Information is available at the ground transportation desk located in each terminal near the baggage claim area for shuttles to University City and Center City. See more information here. You may find hotels farther from campus with cheaper rates. The cheapest one on campus is International House. Please note, however, that the areas of South Philadelphia, North Philadelphia, Northeast Philadelphia, Southwest Philadelphia, Delaware County, Montgomery County, Bucks County and New Jersey are significantly farther from campus than Center City. In many cases, public transportation from these areas to the University is available, but can be time consuming and costly, and is not available 24 hours a day. If you choose to stay farther away, please investigate your transportation and parking options before booking a room.